When summer hits, there is nothing better than a cold, sweet treat to help cool you down. Lemonade is always a good option, but popsicles might be even better. They’re sitting there in your freezer, ready to eat as soon as you need one, and there are no dishes to wash after you’ve finished up. I have always been a fan of popsicles and like just about every flavor you can think of (although I’ll take cherry over grape any day). As a kid, however, pudding pops were always my top choice, and I always opted for vanilla – much to the delight of my chocolate pudding pop-loving family. I don’t buy the boxed pudding pops anymore. Instead, I makeÂ Homemade Vanilla Pudding Pops. My recipe is an eggless pudding recipe, thickened with cornstarch instead of eggs. I like it because it is extremely similar to that Jello pudding I enjoyed as a kid in flavor. You get a very clear, clean vanilla flavor in every bite. I typically use vanilla extract to flavor the pudding, but scraping a vanilla bean into the mixture or even using vanilla bean paste (which is what I used here) can give the popsicle an upscale look by studding it with vanilla bean specks.Â The finished pop is lighter that ice cream and not as overly sweet as some store bought pops. If you would prefer to have a regular pudding and not a frozen popsicle, simply pour the pudding into ramekins and chill overnight in the refrigerator. I like the consistency, which is a bit thinner than most puddings. I love the “skin,” but if you prefer your pudding without it, just put a layer of plastic wrap on top before chilling.Â To release the popsicles, run the molds under warm water for a few seconds. If you use paper cups, you can simply peel it back. In a medium sauce pan, heat 2 1/2 cups milk and sugar over medium heat, whisking to dissolve sugar. Bring just to a simmer. You will see steam coming from the milk, but no bubbles. Meanwhile, whisk together remaining 1/2 cup milk, cornstarch and salt in a small bowl. When the milk/sugar mixture comes to a simmer, whisk in the cornstarch mixture. Whisking frequently, continue to cook for several minutes, until pudding comes to a simmer and begins to thicken. Continue to cook for 1 additional minute; the pudding should thickly coat the back of a spoon. Remove from heat and stir in vanilla extract/paste (vanilla extract with beans suspended in it; plain extract is fine). 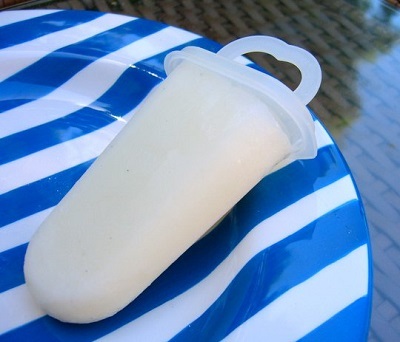 Pour into clean popsicle molds and transfer to freezer.Â Freeze until solid, or overnight. Makes about 8-12, depending on the size of popsicle molds. This recipe was featured in several newspapers, including the Detroit Free Press, Kansas City Star and LA Daily News. Wow…that’s a bit more high-class then I remember getting as a kid! Sounds wonderful, though; and I’ve been meaning to try out my popsicle maker for some time now. Btw; will there be another Blogging By Mail anytime soon? Love the simple recipe. I guess it could be dipped in chocolate to make it more decadent? Now I have to get the molds! Mika – I suppose that you could try dipping it in chocolate, but since I know they don’t sell any pudding pops dipped in chocolate, I wonder if it might be a bit too heavy. I’ll stick with plain, but chocolate pudding is a good way to go if you want something chocolatey. yum, i totally remember my mom making chocolate pudding pops from scratch and i’ve totally forgotten about it…until now. i’ll definitely have to put down my strawberry and yogurt popsicles and try this old treat! thank you for the memory trigger. Yummy!! Summer is definitely the best time of the year, as I loooove ice cream! Pudding pops sound good! I didn’t have them when growing up in Brazil, but learned to make them here in the US. I will try making your recipe, I bet my 4-year old is going to love it! However, I will probably add some cocoa to that, as our favorite ice cream flavor is chocolate! Thanks for bring back memories…I should make these for sure this summer! Made the snickerdoodles you linked to about a month ago and they are delish! Thanks! Oh my god, i haven’t had a pudding pop in AGES! this really did take me back to many summers of my childhood. Thanks Nicole! My sister and I have been craving the pudding pops we ate as a kid. It’s been killing her to find out who used to make them and why we can’t find them anymore. As a fellow vanilla lover, I’ll have to try out your recipe. And, if she’s lucky, maybe I’ll find a way to make my sister the swirls she preferred! These were so good. Only one problem though, they wouldn’t come out of the molds, no matter how much hot water I ran on them. Spooning them out of the molds into bowls took away some of the popsicle novelty. After disappearing for a decade or so, I once again found jello pudding pops in the store and was SOOOOOO excited to bring them home to share with my kids. I made a big deal about how wonderful they are – only to open one up – lick and bite in and practically spit it back out! eww! The kids didn’t even finish the box. I thought of making my own, but was worried I wouldn’t be able to “quintessentially” freeze them, like I remember the box saying when I was a girl – whatever that means. I have been very suspicious that without a Bill Cosby endorsement, and without the fancy freezing capabilities, I would not be able to re-create pudding pop heaven… I am glad you tried! and take it as a sign that I stumbled upon this recipe today – for I got a deep freezer yesterday and I think that might just take care of the “quintessesntial” thing! gonna give this a try today (pistachio is what I have on hand) Bill Cosby help me, they will come out just right!